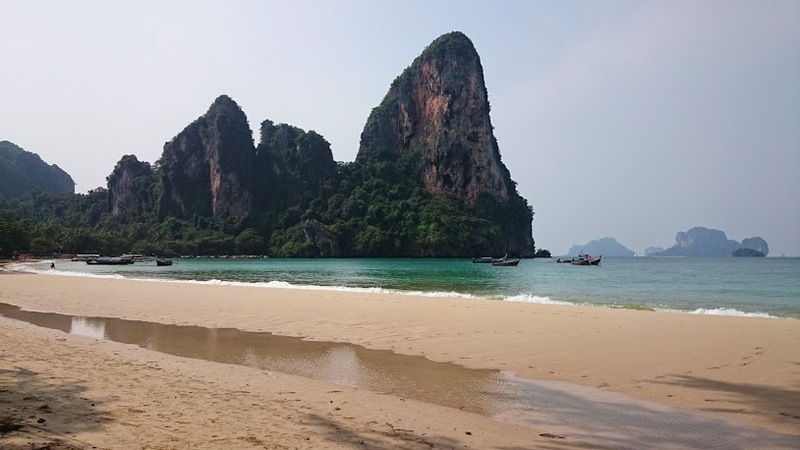 Railay was in my impression, arguably the most beautiful beaches we have been to yet. It had soft clean sand, clear water and wide-open views to a bay bookended by towering limestone cliffs that could not be ignored. Palm trees abounded, as did a serene sense of relaxation that we never obtained at all prior beaches to this point. It also helped that we had an amazing bungalow to ourselves, steps away from the beach and backing up to beautiful cliffs. It was stunning. That being said, the area was a mecca of adventure when we wanted it to be. I (Rob) started each day with a few hours of spearfishing, mostly just cruising the cliff/ocean juncture for decent fish, firing a shot or two per hour as the marine life close to shore was smaller/less present than other areas. Managed to bag a couple barracuda and some snapper to cook up back at our amazing little bungalow. The limestone towers of the beach were far from the only two and there are enough rock climbing shop fronts here to be a world headquarters. We did a halfday climbing tour, which turned out to be a ton of fun. We met some really great people (the Corlett family) and tested our climbing limits and strengths. With over 700 bolted routes in this area, it is actually known as a climbers mecca to enthusiasts the world over. Add to that the prospect of climbing deep water solo and it all makes perfect sense (deep water solo is a style of climbing in which a boat takes you out to cliffs over the ocean, allows you to grab on and climb without a rope to whatever height you are comfortable jumping from). The ocean views from the top of the climbing routes, roped or not were spectacular. A welcomed reward after a valiant climb tests you mentally and physically. You might think that spearfishing and all of this climbing would sum up the adventure options in Railay but you’d be wrong. We also met a fellow traveling couple at dinner one night – Kyle and Lisa (check out their blog here). They were on their own trip around the world. It was refreshing to meet a couple that was going through a lot of the same things we were. Mostly things that could be followed with the hashtag #firstworldproblems, like the stress of keeping up with a blog, all that goes into planning each day and each destination, spending literally 24/7 together as a couple, packing woes, etc. We swapped stories, tips and contact info and made plans to meet up the next evening. The 4 of us met up and headed out to a local Muy Thai fight that we paid $3 for and sat ringside. We actually had to move our seats back a few feet so we would get covered in the fighters’ sweat. They followed the fight with a fire show, something we had seen a few times in Thailand already and love it each and every time. This time however, Lisa was chosen as a volunteer as one of the fire throwers put on a blindfold stood behind her and twirled his fire batons around her as she spun in a circle. Brave girl…. Braver than me, for sure. The next day we all rented kayaks and we dropped the boys by a couple caves so Rob could take Kyle out for a test run on his speargun so Lisa and I continued around the corner to a nice secluded beach where we were able to sunbathe and relax until the boys were tuckered out. It was nice to have a little bit of girl time for me as I have been itching for that for a while now. I think the boys enjoyed their time with the speargun as well. No lunch was caught but they were still able to take a few shots. After our kayak ride, we headed out for our “7 island excursion.” I wasn’t exactly sure how we would visit 7 islands in one day but it was more of a see 7 and visit 4 excursion. They brought us to island after island for some great snorkeling at each. One of the snorkeling stops had a little family of Nemo fish, which was the first time we had seen them – but definitely wouldn’t be the last. One of the stops was a deep water solo stop. Rob was all too excited to get out there. Basically the boat pulls up close to some cliffs that have a depressing ladder hanging from them, you climb up and then rock climb as high as you can or feel comfortable with and then off you go into the water. Rob of course went right up the ladder and began climbing as high as he could go, the only other one to climb as high as him was our guide. After all the water activities were coming to an end, we headed to shore for some barbeque and a fire show. Thai people love their fire shows. They are everywhere. Then came the highlight of the excursion – We went back out on the boat in total darkness and headed out to a nearby cove. Once two or three other excursion boats had headed out there as well, everyone shut off their lights and stuck their hands in the water… bioluminescent plankton. They were faint to see from the boat, so Rob and I grabbed our snorkel gear and jumped in the water… As soon as you hit the surface, they were glowing everywhere. It was so amazing to go under water, stir them up and watch them glow. freaking wow you guys are amazing…I am so jelly…i hope we get to come out there and meet up with you…I love you both ploease take care and let’s get some face time real soon..